At the beginning, one thing was clear. If Epson were to develop an all-new ink jet plotter, it would have to be unique. It would have to be an Epson. And being one the most revered Precision Engineering companies in the world – it got personal. 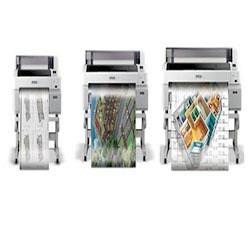 Introducing the Epson SureColor® T-Series. 10", 11.8", 13", 16", 17", 20.3", 23", 24", 29", 33", 36"
10", 11.8", 13", 16", 17", 20.3", 23", 24", 29", 33", 36", 41", 44"
A. Print speeds are engine speeds only. Times shown for D-sized page are based on page size 34” W x 22” L (SC-T3000 model is slightly slower). Total throughput time depends on workstation configuration, file size, print resolution, ink coverage, networking, etc. B. Cartridge yields vary considerably based on images printed, print settings, paper type, frequency of use and temperature. For print quality, a variable amount of ink remains in the cartridge after the "replace cartridge" indicator comes on. The printer ships with full cartridges and part of the ink from the first cartridges is used for priming the printer.